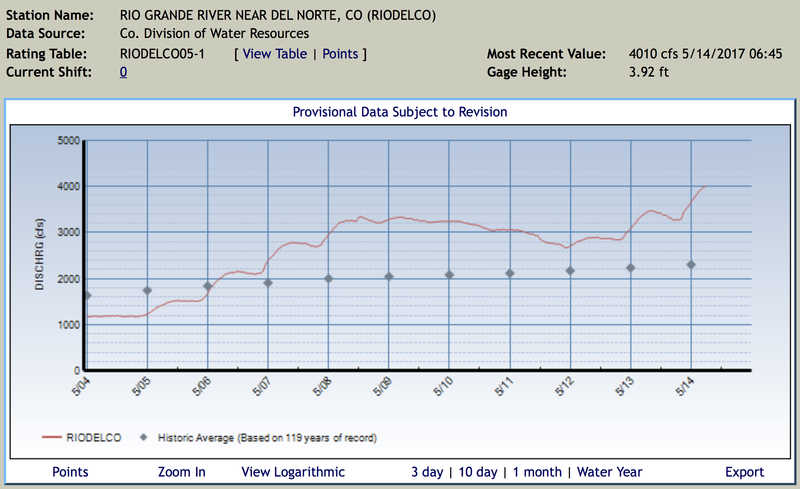 Rio Grande at Del Norte gage May 14, 2017 via Colorado Division of Water Resources. The Rio Grande and other rivers in Northern New Mexico are surging. Experts say the heavy winter snowpack in New Mexico and Colorado mountains, coupled with recent cold snaps and a boost from spring precipitation, mean New Mexico will have more runoff than in past years, and it will last further into the summer season. And that is good news for irrigators, recreational users, municipal water systems and wildlife that depend on the rivers. The Rio Grande currently has twice as much water flowing through it than is typical for this time of year. On Friday, the river gauge at the village of Embudo recorded 4,020 cubic feet per second, which is more than double the 85-year average for the same date. The Upper Rio Grande snowpack, which feeds the headwaters in Southern Colorado, was at 122 percent of its historical median Friday, according to a map published by the U.S. Bureau of Reclamation. Snowpack in New Mexico’s Sangre de Cristo Mountains, which shed water into the river south of the state line, measured at 150 percent. The Rio Chama snowpack, which supplies important reservoirs and the river for which it is named, had a snowpack Friday that was 266 percent of the historical median. Mary Carlson, public affairs specialist for the Bureau of Reclamation’s Albuquerque office, says the snowmelt is strong enough that, for the first time in a few years, Heron Reservoir will be able to fully allocate the water promised to contractors, and El Vado Reservoir is again allowed to store water, which isn’t allowed when reservoirs downstream are at a critical level. Water forecasts from the Natural Resources Conservation Service estimate that El Vado inflow from March through July will be 171 percent of normal. At the Santa Cruz Reservoir, water is cascading down the dam’s overflow spillways, said Kenny Salazar, water manager for the Santa Cruz Irrigation District He expects to see chile crops and kitchen gardens flourish along the eight miles of irrigation ditches in the district. He just hopes warm nighttime temperatures don’t make the Santa Cruz River jump its banks. Santa Fe stands to benefit, too. Snows in the canyon east of the city feed the McClure and Nichols reservoirs, a significant source of water supply for the community water, which, like Albuquerque, also diverts water from the Rio Grande. On Friday, flows in the Santa Fe River before it reaches McClure were at 22 cubic feet per second, which is above the 17-year average of 17 cfs. As of 5:30 a.m. Friday, the river stage was at 11.6 feet. If the water rises to 12 feet, water will start approaching Highway 194. At 13 feet, nearby structures will be threatened. According to the National Weather Service, the water could reach 12.2 feet as early as Friday. Pueblo Mountain Park in Beulah received 4.48 inches of precipitation from Wednesday to Thursday, the NWS said, and has received 5.82 inches in the past three days. Since March 23 there has been 16.04 inches of precipitation at the park. The rain began pelting the town late Wednesday afternoon before turning into hail for a while. The hail then became rain again and fell consistently through the night and into early Thursday morning before tapering off by late morning. Statewide snowpack Basin High/Low graph May 14, 2017 via the NRCS.